> Blog > Pest Information > Say Goodbye to Pantry Pests-For Good! Pests love to gather around your goodies stored in cabinets and pantries. They can quickly become a hassle for homeowners and can get out of hand if not properly taken care of. A variety of critters are known to inhabit the pantries of unknowing individuals including beetles, ants, earwigs, and weevils. To avoid finding these critters in your kitchen be sure to take note of these points. Pantry pests commonly infest baking ingredients such as flour, dried fruit, nuts, chocolate and more. Even your sealed goods aren’t necessarily safe from pests. Cake mixes, macaroni, cookies, seeds and dog food are all attractive to these common pests, regardless of their packaging. Before you get ready for your next big baking session or before you feed the dog, be sure to check for the presence of pests in each of these items. Tupperware type containers are your best bet for keeping pests out of your food. Tupperware is great for keeping your pantry looking nice and tidy, and pests cannot get into them. Anything made of plastic or glass will work, as long as the lids fit tight. Bay leaves are a natural pest deterrent. 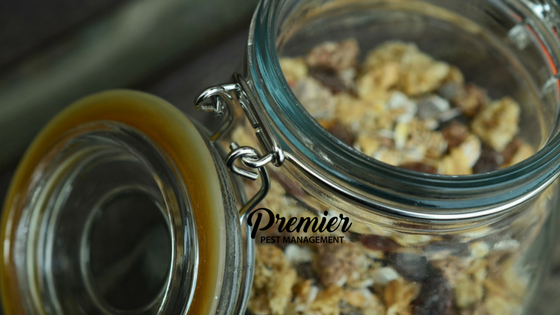 Add one to your canister or package of dry goods to keep the pests at bay. Inspect your groceries before putting them away. Most pantry pests make their way into your home from items that are already infested. Foods in paper or plastic bags and cardboard boxes are all guilty culprits of transporting pests straight into your home. Examine each package you pick up for any signs of damage. If there is even the slightest dent or ding in the item, do not purchase it. For items you already have in your home, inspect and sift through ingredients to be sure they are pest free after sitting in your pantry. Check expiration dates on all ingredients before use, just like any fresh food items. Do your due diligence and toss anything that has been stored for a long period of time periodically. Keep a clean and tidy pantry and kitchen. Avoid letting spills sit for long periods of time. Wipe up any crumbs or spills from countertops, tables, floors, and shelves to avoid attracting any pests to your space. Taking the garbage out regularly can also assist in discouraging any pests to take up residence in your home. Periodically empty your cupboards and clean them with warm soapy water to get rid of any bugs that may be lurking inside. If you find pantry pests in your kitchen, throw away any contaminated foods and place in your outdoor trash can immediately. Then vacuum your shelves in your cupboards and wipe down all surfaces. If you see more than a few pantry pests, give us a call for to book your pest assessment today!